On May 20th, we released AutoInvest, a feature that allows our investors to easily diversify their investments into 100 loans or more. The member feedback has been positive on the ease of use and the functionality that is in place. We created this feature because many of our power-users understood the need to diversify; however, going through the loan listings was cumbersome and time consuming. We are happy to share the early results with you – which show the power of diversification and also the strong adoption of AutoInvest. From the table above, you can see the correlation between a diversified investment strategy and positive returns. Today, those investors who commit to an AutoInvest plan and maintain the plan on an ongoing basis are realizing the best outcomes. 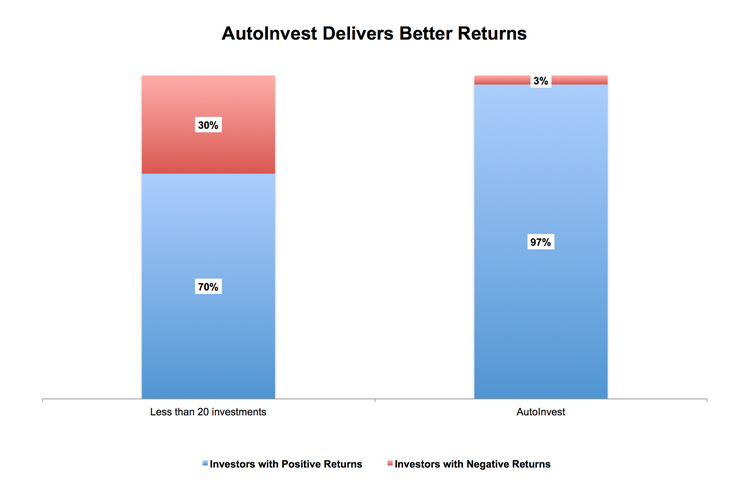 Over 97% of investors are seeing a positive return over 18% while there are over 1,800 active AutoInvest plans. For those of you using the program, let us know your feedback on improvements you would like to see or what you like about it. If you have not tried the feature as an investor – see what you are missing in terms of simplifying and diversifying your P2P loans. Create an AutoInvest plan today. expand autoinvest strategy: add an option to invest only in loans whose users have repaid at least one loan? 18% over what period of time? The Stats released for the AutoInvest Program clearly shows the protection that diversification offers. However I have been unable to find stats on the actual number of unique investors that make up the 97% positive returns. 97% of the AutoInvest investors NOT loosing money is absolutely stellar, but how many individuals is that? If it is a statistically significant number, the WSJ and Reuter’s will trip over themselves to cover the story! I personally would like to set autoinvest to only invest in loans that are in the ‘business’ category.